Tired of plain salads and steamed veggies? 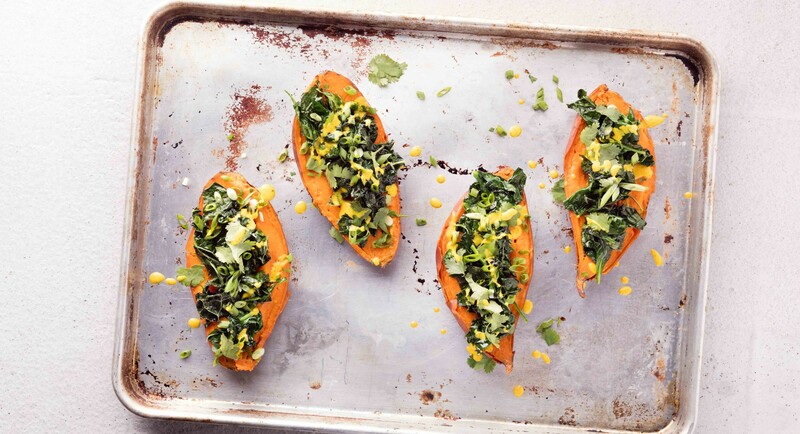 Try this stuffed sweet potato instead. Filled with sautéed greens, topped with sliced avocado, and drizzled with a tahini-turmeric dressing, it’s a totally satisfying plant-based main or side. Wash sweet potato well, then, using a fork, poke holes all around to release steam. Wrap in aluminum foil, then roast on a baking sheet until tender, about 40 minutes. When almost ready, heat coconut oil and salt in a skillet over medium-high heat and stir in baby spinach and kale. Sauté until just wilted (greens should retain their bright color), then remove from heat. In small bowl, whisk together all of the ingredients. Thin with a bit of filtered water if necessary. Cut sweet potato in half lengthwise and top with sautéed greens and sliced avocado. Sprinkle with cayenne, garnish with green onions and cilantro, and drizzle with dressing.